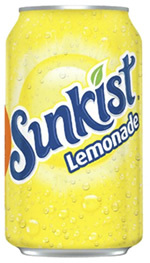 Sunkist Lemonade is a carbonated Lemon flavored soda from the makers of Sunkist Orange soda. There is also a diet version of Sunkist Lemonade and it has the same caffeine content. Sugar content: 43 grams (per 12 ounces). How Does Sunkist Sparkling Lemonade Compare? Sunkist Sparkling Lemonade contains 3.42 mgs of caffeine per fluid ounce (11.55mg/100 ml).